Harlech Castle Two Kings Statue. 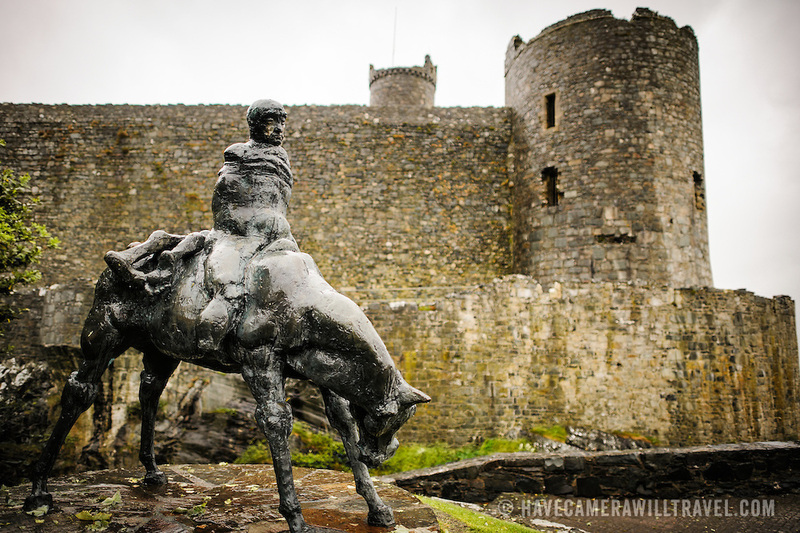 The Two Kings statue at Harlech Castle in northwestern Wales. Sculpted by Ivor Roberts-Jones and unveiled in 1984, the sculpture depicts the Mabinogion story of Branwen, a lament of the folly and carnage of war. In the sculpture, the figure of Bendigeidfran, bearing the body of his nephew Gwern, symbolises the sorrowful burden that love can be. Harlech Castle in Harlech, Gwynedd, on the northwest coast of Wales next to the Irish Sea, was built by Edward I in the closing decades of the 13th century as one of several castles designed to consolidate his conquest of Wales.